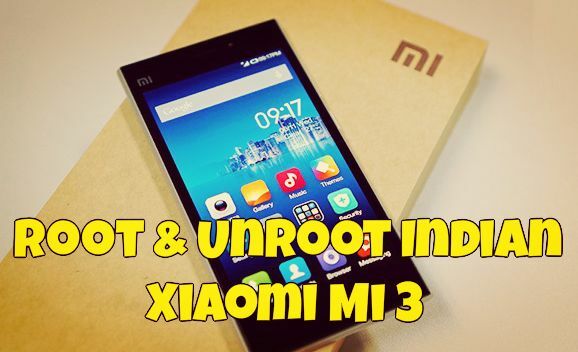 This rooting guide is only for the Global and Indian Xiaomi Mi 3 users, we tested this method on our Mi 3W running MIUI KXDMIBH34 (Stable build). In this guide we’ll show you how you can easily root and unroot your Mi3 smartphone in some simple steps. Rooting and unrooting doesn’t result in loss of any data. we have rooted and unrooted version 18 and then again rooted version 34 without losing any of our data. So best part of this guide is that you don’t have to worry about losing your phone data. This method only roots your device. It doesn’t flash any custom recovery. Rooting has lots of benefit and after that you can lots of mode and rooted application on your device and also remove the system app form your MI3. Before following this guide do check the MIUI version by going to Settings > About phone > MIUI version. It should be on KXDMIBH34 version, if not then update your device first and then use guide to root your phone. Step 1. Download the root.zip file on your desktop and don’t extract the folder. Step 2. Put these files on in the SD card of your phone. – Not inside other folders. Step 3. Now open Updater app on your Mi 3 phone, click menu – select “select update package option”. Then select the “root.zip” that you downloaded on step 1 and update. Now your phone will ask you to reboot. Select reboot now. Step 4. Reboot your system now. Go to Security app – Permissions – Root permission – Turn on. U have root access now. Now enjoy your rooted Mi 3 phone. Step 1. Go to Security app – Permissions – Root permission – Turn it off. Step 2. Download the unroot.zip file here. Step 3. Connect your phone to the pc and move the file on your phone SD card. Step 4. Now open Updater app on your Mi 3 phone, click menu – select “select update package option”. Then select the “unroot.zip” that you downloaded on step 2 and update. Now your phone will ask you to reboot. Select reboot now.